The TAU-600+ is one of the worlds most advanced clocking machines with a fantastic 3 inch, TFT high-definition graphical interface, and great feel keypad supporting T9 dictionary input. 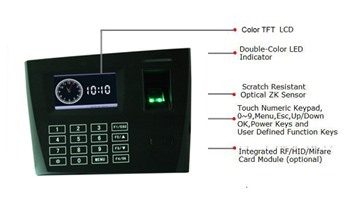 Latest Biometric Technology and Proximity clocking machine in one. The TAU-600+ adopts the worlds most advanced fingerprint sensing technology and algorithms, fast identification speed, the False Acceptance Rate (FAR) is 0.0001%. This model is based around the very successful TAU-600 but with some minor enhancements. 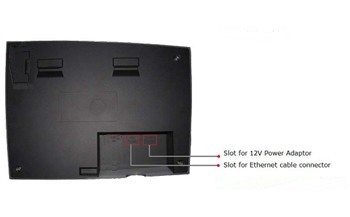 There is a more updated case with a touch keypad. The new TAU-600+ also has the ability to download the clocking's onto a USB memory stick making the device operate in standalone mode with no network connection. As well as the advanced biometric reader there is also a built in RFID proximity reader giving more flexibility to the reader technology allowing employees to clock using RFID cards or fobs. The TAU-600+ embedded operating system is built on a Linux platform for reliability and functionality. Communication to the TAU-600+ is via 10/100mB Ethernet port making it easy and affordable to install in any work environment. 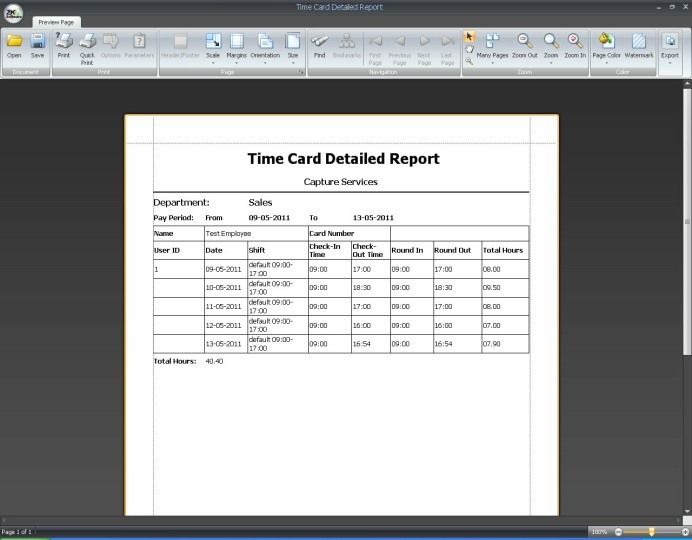 A choice of clock formats is also available and also the ability to add pictures or notices as a screen saver. As well as an audible beep there is also speech announcements saying ‘thank you’ if verified OK or ‘please try again’ if not recognised.  There are other voice announcements to say when clock is full etc. A start/end audible tone is also programmable into the TAU-600+ to indicate break, end of work etc. 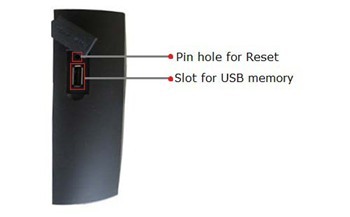 There are also 3 methods of clocking fingerprint, RFID card/Fob or with a PIN number, both can be set up on all accounts. Clocking's can be reviewed on the colour screen of the TAU-600+ by the employee to check the times they have clocked over the last 24 hour period or all clocking’s by an administrator. 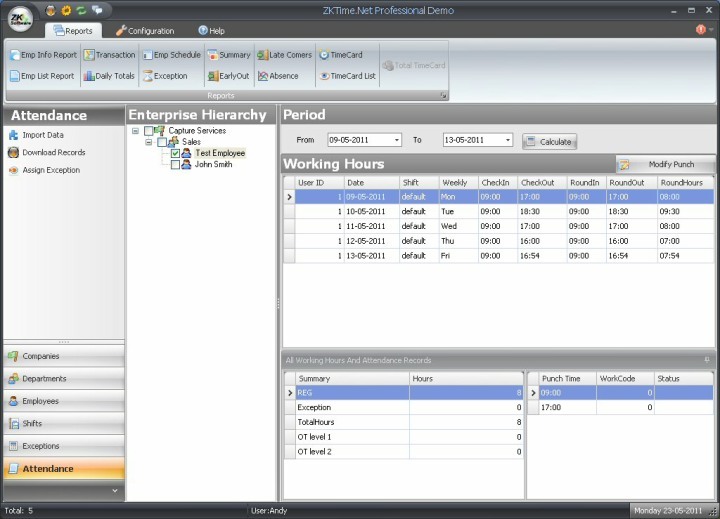 The ZK Time software that is supplied with the TAU-600+ is a full version of the software that has been specifically written to suit all types of business from small to large with no employee number restrictions and multiple clocking machine support. 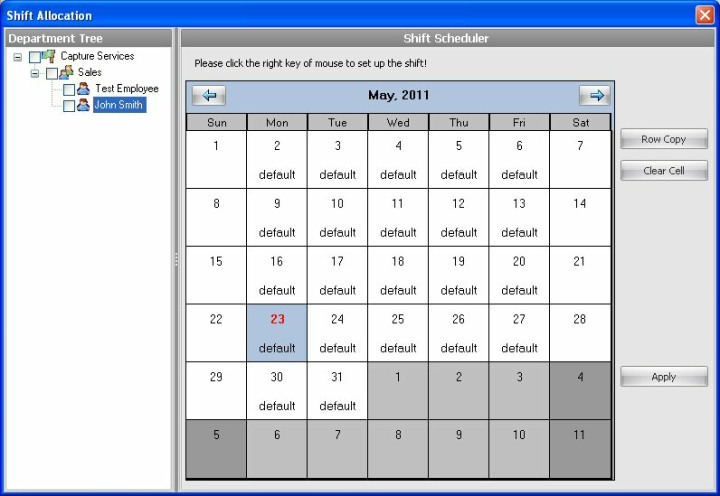 Features include employee record details, multiple shift patterns, manually amend clocking's for people who forgot to clock and many more feature rich functionality. 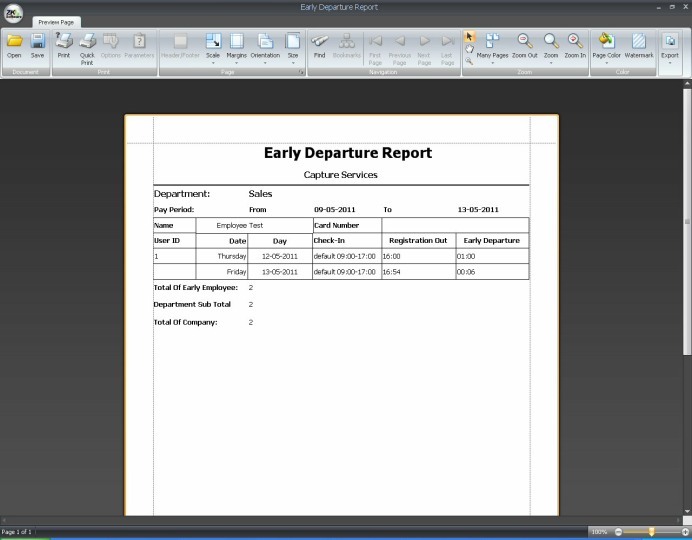 Report generating is also built into the software and the ability to export into many different formats. 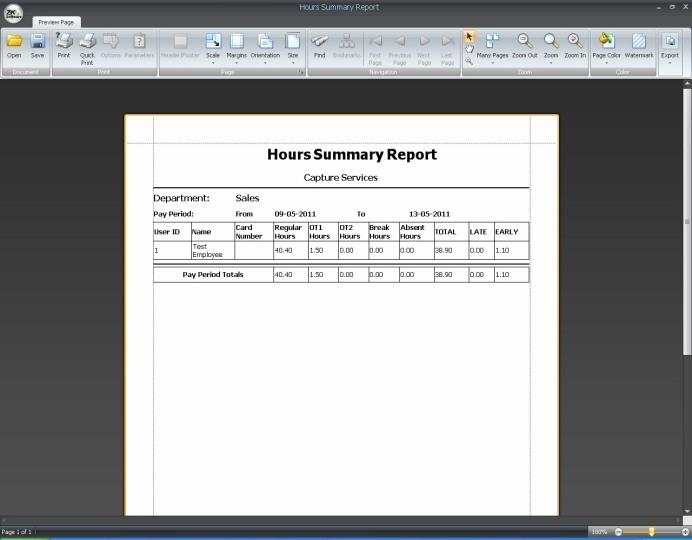 The TAU-600+ and the software is a complete package and you can be up and working within a few hours. 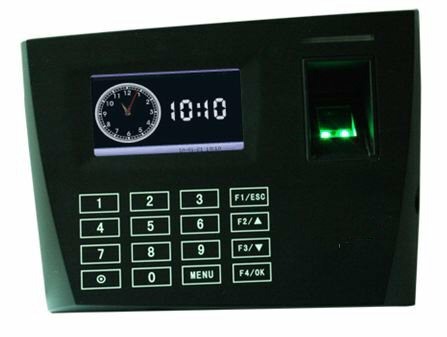 The TAU-600+is a system that most small to medium size companies will be very impressed with giving a reliable fingerprint reader clocking machine and a fully functional time and attendance software that you would expect from a more expensive system.